You can never go wrong with a good breakfast. During the week, I never have time for “real” breakfast, usually it’s just some toast or maybe fruit, but it is almost always eaten on my way to the bus stop. So, whenever I get a chance to actually sit down and enjoy breakfast, I’m a happy camper. 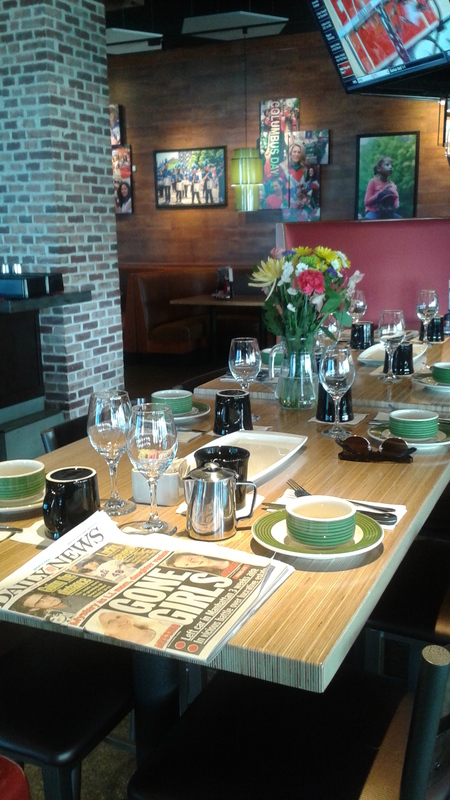 Applebee’s at the Hutchinson Metro Center invited the Bronx Bloggers back to try out their new breakfast menu. As you may remember, a couple weeks ago, we got to sample their shareable bar menu and cocktails and were thoroughly impressed (and stuffed). As someone who despises mornings, I was glad that within just a couple of minutes of arriving, I was offered a choice of coffee or tea to start. The table was beautifully decorated with a vase with fresh flowers and they even had the Sunday paper out, which I perused while I waited for everyone else to show up. I really appreciated that they had a variety of tea going beyond just plain Lipton – including Earl Grey, Rooibos Chai, and China Green. I chose the Rooibos Chai, which was delicious. An array of pastries, bagels, and croissants were displayed. I snuck a strawberry turnover before everyone else arrived; it was light, flaky, and had just the right amount of filling. The bagels were okay. I would LOVE if they could strike a deal with Empire Bagels just a few blocks away. I did not try the croissants because (and I am 100% aware of how bougie this will sound) ever since I had croissants in Paris, I try to avoid them here in the U.S. for fear I will be disappointed. Then out came the main courses! Some of my personal favorites were: the parfaits (yes, yall, Applebee’s has parfaits!) layered with vanilla yogurt, blueberries, strawberries, and crunchy granola, the waffles topped with whipped cream and berries, and the homefries , which were so nicely seasoned I didn’t have to add any salt and pepper like I have to do at some diners! They also served up omelettes, but I didn’t have any because I was too busy stuffing my face with the waffles and home fries.